On Tuesday December 4, 2017 Michael Farmer, author of the award winning marketing business book Madison Avenue Manslaughter presented his Plan B for the industry to turn the manslaughter into a make over that would get brands and agencies moving again. This is the transcript and video of the second of three parts of that presentation where he defines the issues that Plan B must address to be successful. What is Plan B? Before you decide what Plan B is, decide what kind of Plan A problems have to be solved. I think a lot of people are getting this wrong because you hear people say, ‘our real problem is there is no talent’ or ‘we are not digital enough’ or ‘there are too many pitches’ or ‘the bench markers’. And all of them add up to ‘there is nothing we can do about it. We are just screwed, we’re victims and we just have to do the best we can. We have to win as much business as we can, be as creative as we can under the circumstances, and even though we are on the losing side, we have to not be as big a loser as our competitors’. I think that agencies today have misdiagnosed, through the lack of the right kind of information, what really is happening to their business. So, I’m pleading with you today to think about a different type of Plan B based on what has not been working in Plan A. 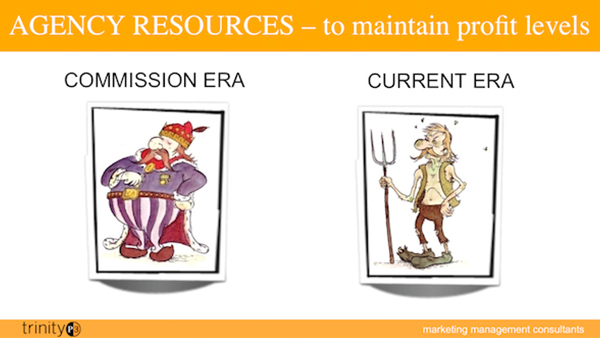 Plan A being the way that agencies have competed with one another and with their clients over the last 30 to 60 years. I’m going to have to talk about words that have really never had a place in the industry: price, productivity, and profitability. Price for agency services, the productivity of agency people in carrying out scopes of work, and the profitability that is associated with doing that well or doing that badly. Here’s a real agency office. I’ve disguised it, calling it the Icarus agency. It is a client of mine and they have 10 clients, which I have used the military alphabet, Alpha to Juliette. Ten clients, adding up to $23 million of sales. That’s the typical size of an agency, not a headquarters’ office but a good sized, New York-based agency office and you can see that the largest client is Hotel with 7.4 million. The smallest client is Foxtrot with 67,000 in income. When I ask finance to give me a view of each client in the way that they kept the numbers, this is what they gave me. You’ve got the client name, the fees that they’re getting, the whole-time equivalents who were working on it or at least in the resource plan that was promised to the client who add up to a certain number of hours, which was the basis for the agency revenue. If you divide the fee by the hours you get the fees per hour. Now how is it that there is a big variation in the fees per hour? The lowest one is client Bravo at $54 per hour and the highest is Juliette at 214 and what could you say has possibly gone on that created a 4 to 12 difference in hourly rates? Well, it could be there are more senior people in it. It could be the competitive position of the client and they need more strategy work or maybe they need heavy TV work or Google or maybe it’s the salesmanship of the agency trying for whatever the client has agreed to for the fee. In a lot of these cases, as I found out later, the client told the agency what the fee was going to be because we have a budget this year (e.g. client Delta—we have a budget of 500,000–that’s all we can spend). There’s a lot that we can do but we only have a budget of $500,000. And the agency said well ’we’ve got some good senior people we can put on that –2 FTEs and they’re getting $139 per hour. This averages out to $138 per hour for the 23 billing and the 94 FTEs—that’s planned service, planning and creative and production people. Now, if you do the math (and I’m sure most of you know how to do that) $138 per hour for 1760 hours = the fee and then half of that, roughly, is overhead. That hourly billing rate supports people that are making between 104,000 and 111,000. That is not a lot of money. 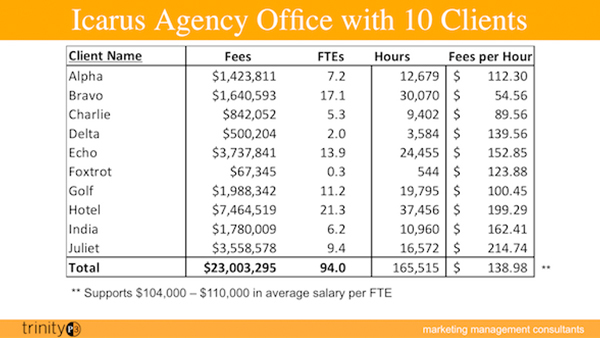 That is an average agency office whose average FTE on its clients is earning an average 104,000 to 111,000. I don’t know how different it is here, Australian dollars, different salary levels etc, but I can tell you that is not a lot of money. It might be that if you’re hiring people, as they do in the States, right out of college at 30,000 when the consulting firms are hiring them at 75,000 right out of college, paying them a $20,000 signing bonus, up to 95, and giving them another 15,000 end-or-year guaranteed bonus, which takes them up to 110,000 in their first year, knowing nothing. 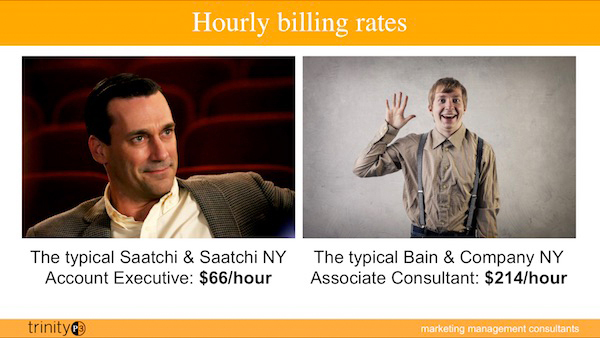 The difference in economics between the consulting firms and agencies is all in the hourly billing rate. And the consultants are dealing with procurement too but procurement is signing off on $500 an hour for an average team as opposed to 138. But here’s what this tells me. In fact, this is what I saw when I went to Ogilvy 25 years ago; how much work are you doing for that? How much work are the 94-people doing, client by client? Well, they didn’t have records of that. I had to go and do what they call ‘job jackets’—we paid Joe Blow, the photographer so much for the Ford shoot—oh, that was for a print ad. It took us 7 weeks to reconstruct the 360 briefs that Ogilvy U.K was doing 25 years ago. Today I’m working in Mexico, 15 Mexican ad agencies; one of them has 12,000 briefs and they’re not huge, Facebook and things. So, you can imagine how much work it is to reconstruct the scope of work for an ad agency that’s doing 12,000 briefs across its 20 clients compared to one agency doing 360, 25 years ago. But today, what hasn’t changed in the industry is that nobody is keeping track of what work is going on client by client. How much work that measures and what that implies for the number of people working on it. Coming from the outside I could not figure out what the hell was going on unless I know how much work are you doing, how much are you being paid for it and how many people does it take client by client? And where that varies—why does it vary? because that’s the answer to figuring out who makes how much money? I think of this as kind of a triangle: you’ve got how much work are you doing on the top. How much are you being paid (this is client by client) and then what kind of resources and costs do you include against that? If you have all three of these dimensions and then you take the fees and divide it by the workload you’ve got the price of the services. If you have the resources, the head count or the costs and you’ve got the workload then you can say how much is Darren Woolley doing in our creative department? How much does the average creative have to crank out for this client? Then you have income and costs and agencies know what that number is. At least they come close to it through timesheets and knowing we’re making money or not making money. But they don’t know that as well as they’d like. Still, at the end of the day you know what office profitability is. But I have not come across, in 870 scopes of work that I’ve analysed with my company in the last 25 years, a single one that had a scope of work that was usable for this purpose. 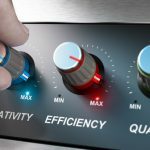 It’s a very heterogeneous scope of work so we need to assign a value to each of the types of deliverables that an agency does in accordance with, perhaps, how many man hours does it take? We found there were 4 dimensions: the media type; TV, radio or print; direct marketing, social/digital etc. The detail—is it a TV 30 or a TV 15 cut-down, an adaptation or an origination, and is it low, average or high creative complexity? A high creative complexity origination is usually for a product that’s never been sold before or a new vehicle or automotive re-launch of the new Toyota Corolla, a new campaign. Whereas, an adaptation, low creative complexity is cranked out a million and you’re just doing another million and they have very low values. Anyway, you created a unit of work to cover the 7,000 different types of permutations and combinations of media types, detail, origination/ adaptation, three levels of creative complexity so each one of them has a value. So, we can say if you have 1,000 briefs at 300 scope metric units or 100 scope metric units or whatever, but you need a way of measuring workload. By the way, this is not a tricky problem for this industry. It’s doable. It’s just that this industry’s never done it. It didn’t do it I think because if you go back to the commission days, what was the point of keeping track of workload? You made so much money out of commissions you didn’t need it. Besides, what matters is how much they spent on media, not how much work you were doing. So, the industry, which developed a laissez-faire attitude about workload many, many years ago when it was commission-based income, is now really up with its back against the wall because the workload has exploded in volume and nobody is keeping track of it. 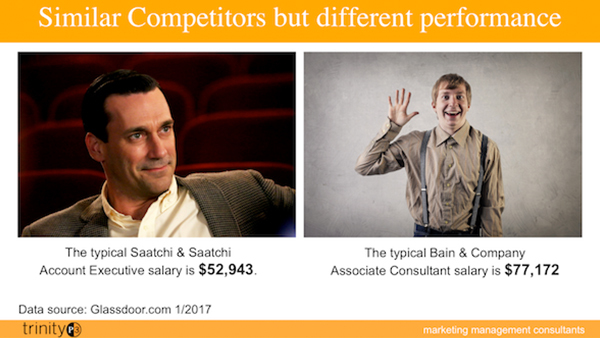 You’ve got procurement cutting fees and you’ve got marketing experimenting with scopes of work and you’re caught in the middle (assuming you’re all agency folks here). 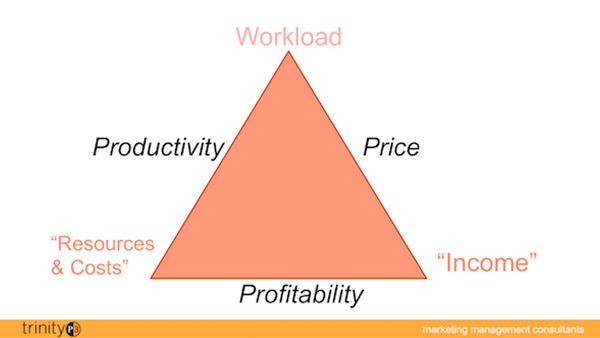 Figuring out price is important but you have to understand how to do workload. Figuring out productivity is important because if there are huge differences client by client in price and productivity, one of them is going to be right and one is going to be wrong. There are going to be low price clients and clients that require an unacceptable workload if you’re a creative and that’s what we’re trying to figure out in order to analyse agency operations. Now, this shocking price curve is the result of price per scope metric unit among my clients over 25 years. I’ve taken inflation out so this is calculated in 2015 dollars U.S. These are 100,000s of thousands of dollars per scope metric unit but don’t get hung up on what a scope metric unit is. Think of it as a TV ad equivalent. If everything were done in TV ad equivalents in the scope of work you wouldn’t be far off. Ogilvy U.K in 2015 dollars was earning, from its commissions, $435,000 per unit of work. An ad agency today, if it’s lucky, is earning $139,000. That has been a real two thirds reduction in the price for what you’re being paid and this is consistent with every client I’ve ever had, every agency, and every client within the agency portfolio. The reason the price curve is coming down is that fees are being dropped and workloads are going up in an uncontrolled way. 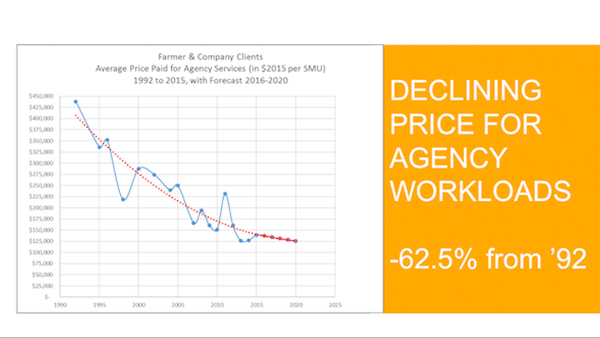 If you divide one by the other; an increased denominator and a declining numerator then you have a declining ratio and so agency workloads have gone up, agency fees have come down therefore the price of the agency services has declined in a regular fashion. Among my clients and new clients, it’s somewhere around the $139,000 level. It’ll probably be round the $125,000 level next year because procurement’s going to cut even further and the workload’s going to grow even further and nobody is controlling it. No agencies control their price. It’s being controlled by their clients. It’s a very bad place to be when the clients are unhappy. Another thing happens when prices go down and you need to deliver a growing profit margin, which is what the holding companies require, you have to downsize. When you downsize and the workload is going up then the creatives have to crank out more work per head. This is my experience with my clients. 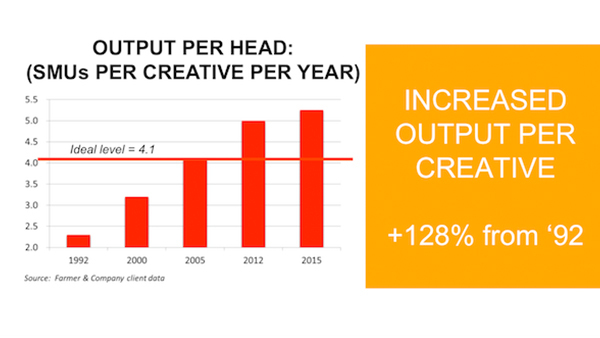 I have measured this from Ogilvy 1992 where they were doing 2.3 SMUs per creative (2.5 TV ads per creative or 5 per team) in a single year—that’s more than double today. Since I invented the SMU, I figured out what was the right level. The right level for this unit of work was the average creative should do a little over four a year because it was sized at about a TV ad. Well, we blew right past that in 2005 because agencies have been downsizing to meet holding company margins, the workloads have gone up in an uncontrolled way so creatives today are doing over 5 on average. But I’m going to show you in a minute that there are clients where they’re doing 10 to 20 SMUs per head because the fees are so terrible. So, what have we concluded here? You’re in an industry with declining prices, declining head counts, and growing workloads, and you’re shoving more work through fewer people and stretching them. In addition, you’ve been shedding senior people because they’re expensive, and keeping junior people. So, you have more work being done by fewer junior people and they’re not solving client problems, which is why clients are turning agencies over more rapidly and going in-house. I mean this is a doom loop. And it’s a doom loop as long as it continues without management getting in there and saying, ‘we’re going to do something about this’. 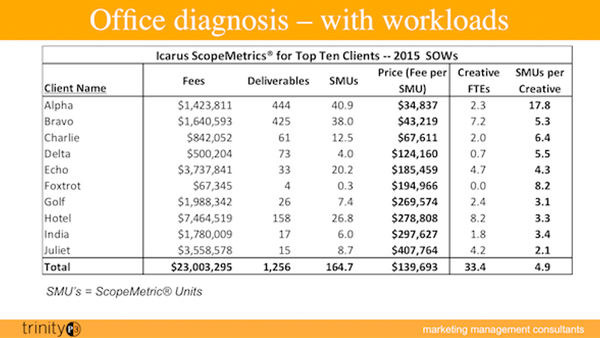 Here’s the same Icarus agency but I’ve put in, along with the fees—the 23 million, the number of deliverables in the scopes of work, their scope metric unit value, and divided the fees by the SMUs to show the price. Now, if you assume the SMU is a good homogenizer; that 30 Facebook posts are equal in effort to one TV ad or something like that. If you assume that’s okay, then a SMU is a SMU and if you’re being paid $34,000 per SMU by client Alpha and $407,000 by client Juliette, one is paying a whole lot of money and the other one is paying next to nothing. But the average is 139,000, which is just about where the industry average is today. So, you go into an agency and you review the portfolio of clients and you say ‘this product you’re selling, the SMU, you’re getting 34,000 from these guys and you’re getting 400,000—how come? And the how come is that no one has the slightest idea of how much work they’re doing. The agency management doesn’t have the slightest idea, the CEO of the office has no idea what’s going on in each of the 10 clients. The CFO has no idea of what work is going on. None of the clients know what’s going on in each other’s business. Whatever they’re dealing with they’re dealing as best they can and they’re under a lot of pressure, particularly client Alpha here, which is 1.5 million –a reasonable size client, it is doing a ton of digital and social media work for 144 briefs and getting very little money for it, having 2.3 creative FTEs to do 40 SMUs—nearly 20 SMUs per head when the standard is 4 to 5. So, they’re cranking out 5 times as much as they can, going crazy, people are quitting, but nobody can say, ‘the reason that’s happening is because we’re doing 5 times as much output on this client as we are on the average client. And then on the high price client, Juliette at 400,000, doing 15 deliverables for 8.7 SMUs—a lot of TV work. They’re only doing 2 SMUs per head—they’re pretty comfortable. When I went through this I went, ‘thank God, you’ve got these clients that are above 139,000. You’ve got Golf, Hotel, India, Juliette that are above that and the others are below because they’re shoring up the profitability. But if your client ever gets wind of the fact that they’re paying well over the odds for your resources you’re in trouble. And guess what (I didn’t know anything about it), but they lost their top two clients about three months later. They had to downsize by a third. They have really not recovered because they had to go through a major downsizing without the cash cows. So, you’re kind of screwed if you’re being underpaid. You’re in danger and vulnerable if you’re being overpaid in today’s market. You cannot take comfort in a portfolio of clients in which half are holding up the other half and you’re o.k. for the holding company on average. By the way, on an average isn’t very good because the average billing rate is $138 an hour, which is only supporting $100,000 to $110,000 people. You don’t have a huge talent pool on that basis. This is a scary situation and this is typical of what I find today in every agency I diagnose. It’s a one-off diagnosis because nobody ever sees this because nobody has any workload metrics. So, CFOs can only look at profitability. It is quite possible that one of these clients will be running a 15% margin and that’s why client Alpha only has two people for a ton of work because they’re making a margin. They’ve allocated resources in proportion to the fee and not in proportion to the work. That’s the way agencies work today. That’s what finance directors will do, they’ll say ‘what is this—a $2 million client? We’ll, you can afford X number of people. That’s how many we’ll give you.’ Nobody knows how much work is involved. Actually, if you graph any office, it looks like this. The balls there are the clients. The price along the horizontal axis is the price per SMU from high on the right to low on the left. Then, up and down it is the FTEs or the number of people per SMU. The red clients are underpaid and under-resourced and these other ones, that are supposed to be green, are over-paid and over-resourced. And the average is where those lines cross. Here’s the problem. That vertical line, which is set at $139,000 per SMU, is moving to the left every year because the industry crisis is coming down. So, all of these balls are getting shoved to the left and that means that resources, everything’s being shoved to the lower left-hand corner. So, that means over time, even a stable portfolio of clients (no new or old ones) is going to show a deterioration in the amount of people that can be placed against the workload. Because we can expect the workloads to go up every year as the fees come down. So, even in a stable situation, if workload is not being controlled, measured, or negotiated for fees, the average agency portfolio will get worse in quality. In other words, the productivity will go up (more work per creative) and the price per SMU will go down. It’s a combination of this, which is a static view and that price curve, which is shoving everything to the left. The other one, which is a little more meaningful, goes down the other way. 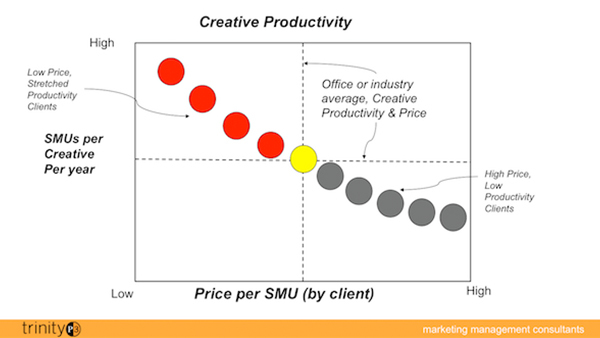 This is creative output per creative on the left-hand axis against the same clients arrayed by price per SMU. Upper left-hand corner: agencies cranking out a huge amount of work per creative head for being low priced. Understandable: low price—fewer resources—a lot of work. Whereas, down here, the big fat clients that pay well have enough resources to do the work comfortably and somewhere there is an average. But it still means that big proportion of the portfolio is under-investing and those clients are at risk. Those clients on the left-hand side are at risk for quality. The clients at the right-hand side are at risk for over-charging. The whole portfolio is at risk and this is the standard situation today of ad agencies. It isn’t the standard way people think about the agency problem but as soon as you measure workloads this is what emerges. What about profitability? During the commission era agencies could afford senior people, very high priced, lots of resources. Ogilvy had 3, 4 and 5 teams on every client back in 1992. That’s why they weren’t making any money. That’s what we discovered. There are no more multiple teams today—it’s just gone and the teams are more junior and underpaid. There’s been a real serious deterioration in real dollars (take inflation out) in average pay and billing rates. So, there has been a decline in composition of the head counts. This is a little unfair to Saatchi but what the hell. Kevin Robert, CEO of Saatchi wrote the forward to my book and he was a client (he argued with me about a lot of things) so I don’t mind picking on him, he is now gone and made some unflattering remarks about women, which cost him his job at Publicis. Let’s look at Saatchi. A person, one year out of college in an agency at Saatchi U.S, according to glassdoor.com makes $52,900. That strikes me as a high number, having looked at salaries but I’ll accept that a relatively junior account executive makes $52,000. 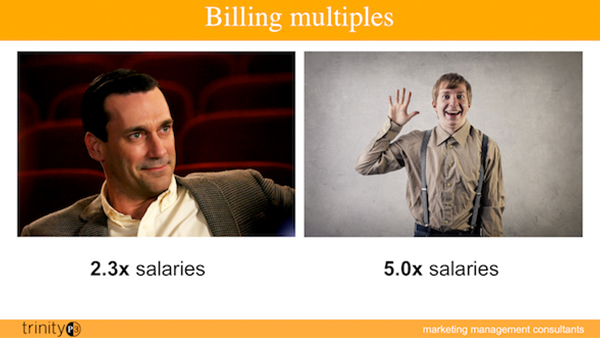 Billing multiples—what do we charge the client as a multiple of salary? You know how procurement does it? It’s direct cost plus overhead rate plus profit margin = blah blah blah. They don’t quite do that at the consulting firms; the consulting firms just tell them what the hourly rate is, take it or leave it. When you look at that, building multiples for a 15% margin and one times overhead rate, agencies are marking up their people 2.3 times. So, a hundred-thousand-dollar person is being billed out at two hundred and thirty thousand. Typical, 15 % margin, one times overhead rate. 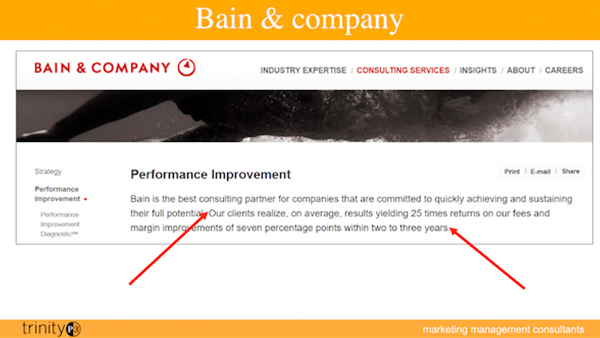 Five times salaries: Bain, McKinsey, BCG, Deloitte, Accenture–it has been standard for thirty years, that is where it is today and procurement accepts it. So, if you work that out, given the differences in salaries, the Saatchi and Saatchi one year person is being billed out at 66 an hour and the Bain guy is being billed out at 214. Why? The quality of the person could be comparable and I think it comes down to this. ‘Our clients realise on average, results yielding 25 times returns on our fees and margin improvements are 7% points within two or three years. A large amount of effort in a consulting relationship goes into negotiating the relationship and what’s going to be done. If you are a big advertiser and you’re growing at 3 % per year and you figure you should be growing at double the rate, a consulting firm will say we will put together a relationship based on our doubling the rate of growth over the next five years. That will form the basis of our scope of work, of our budget, and of the need of a commitment for a long-term relationship, o.k.? And we expect to deliver an X-time return. If the return is big enough, who cares whether it is a five times multiple on fees. I pulled this off Saatchi; it is one of the worst websites in the industry, and I honestly picked it because I worked with Kevin. It is all over the map, what the purpose is. 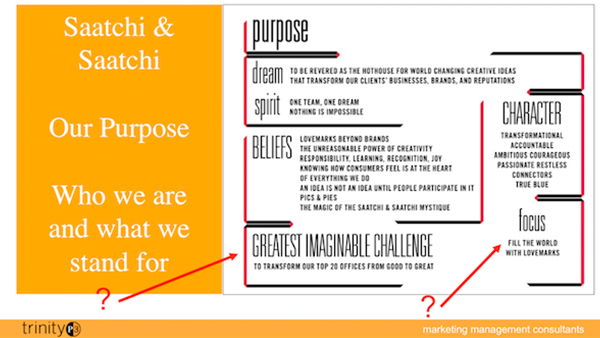 ‘Our purpose; we have a dream to be revered as the hot house for world changing creative ideas that transform our clients’ business as brands and reputation.’ It isn’t what they actually do. ‘Spirit, one team, one dream, nothing is impossible, beliefs beyond grand ‘ blah, blah blah but you get down to the greatest imaginable challenge and that is ‘to transform our top twenty offices from good to great.’ I tell you I wouldn’t pay five times multiple to help them go from mediocre to okay. Or to fill the world with love marks, which is the other focus. Proctor and Gamble was their largest client. General Mills was their second largest client; they just got fired from that. Toyota worldwide is sort of next in line. They did a fabulous job with Toyota in the States. They got fired in Europe because they are not focused on achieving client needs. They don’t ask about it, they don’t have the capability of figuring out what needs to be done to make it better, except in certain pockets. I think their L.A. office is fabulous but it is a different group of people. What they do there has nothing to do with what they do anywhere else. This comes from the CEO. This is the CEO’s vision and it’s a highly romantic and qualitative vision for the kind of dialog that he or she can have with the creative staff or maybe even in new business situations but it doesn’t say anything about what it’s going to deliver in return for the client. While this might have worked a long time ago when TV advertising was new, and really creative TV advertising really drove brand growth, it is not true today. Whatever this is a vision for, it is not a vision for the problems of clients today. And a lot of agency websites are sort of variations on this. Inward looking, narcissistic about creativity but not really saying, ‘we’re really good at figuring out how to make you better’, which is what clients need and that’s what CMO’s and their CEO’s need today to invest money in more media spend, in agency fees, and higher multiples for your services. I think, in the end if that is Plan A, which is strong belief in 1960’s creativity, don’t track work load, don’t negotiate work load; do whatever the client wants to have done at whatever fee they’re prepared to pay. I think that everything else that we’re seeing in the industry is a symptom of that Plan A—that set of beliefs. I think the loss of AOR status, the in-house agencies, the pitching process, the loss of respect, the decline in fees, the experimentation with workloads; I think all of those are symptoms of a business concept that worked a very long time ago when the world was in a different place in terms of media types and underlying GDP growth. We’re in a different place today. 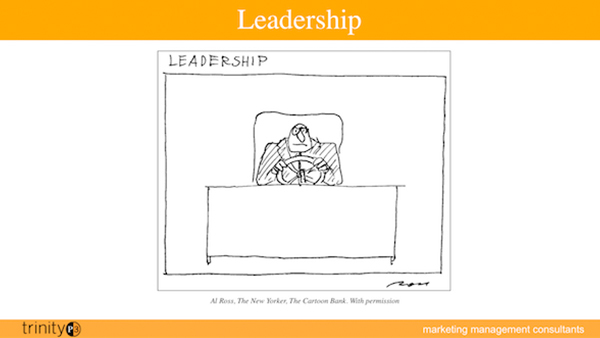 That business model is held intact by many agency leaders. You see it all the time. A new CEO comes into an agency and they say, ‘we’re going to get back to basics; we’re going to invest in creativity, we’re going to win a war’ and this, that, and the other. The truth of the matter is; no one is paying for that. So, let’s decide what’s wrong with Plan A. 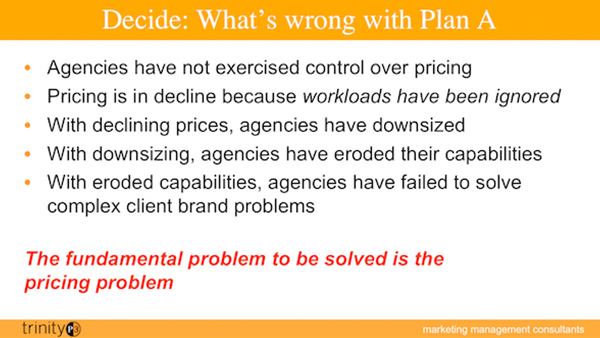 Agencies have not exercised control over pricing. 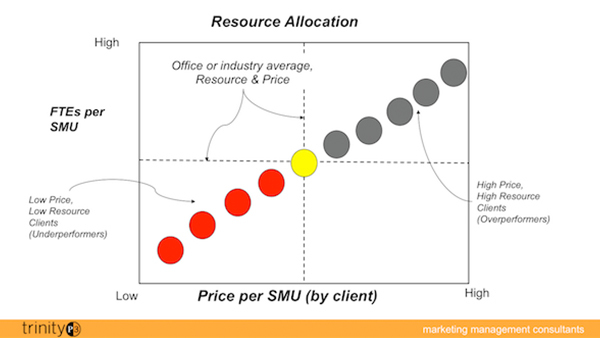 Pricing is in decline because workloads have been ignored. With declining prices, agencies have downsized. With downsizing, agencies have eroded their capabilities. With eroded capabilities agencies have failed to solve complex client brand growth problems. With eroded capabilities they have failed to solve problems and therefore, pricing is the number one problem in the industry. 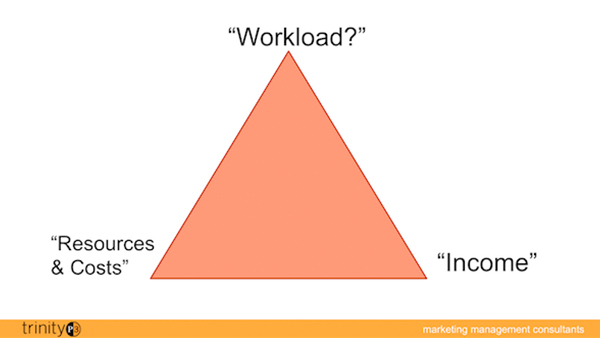 Getting control of pricing means getting control of workloads. Getting control of workloads means negotiating fees on a different basis. Negotiating fees on a different basis can only succeed if the agency mission is a different one. It may sound like a simple thing to say, ‘you guys have got to get control of pricing’ but you know what it means? It means changing the whole way you think about the business; why you exist, what you have to keep track of, who’s accountable for what, and how you negotiate being paid? That’s a complete change of culture and there aren’t many CEOs who want to take that on at this point in their career when many of them are making 7 figure salaries for doing Plan A, delivering to the holding company. So, this is a really tough turnaround situation because the leadership isn’t young enough to care. They’re not going to have to live with the consequences.